We are joined by Dawn of Mud Puddles to Meteors who shares with us her autumn version of a nature bracelet. 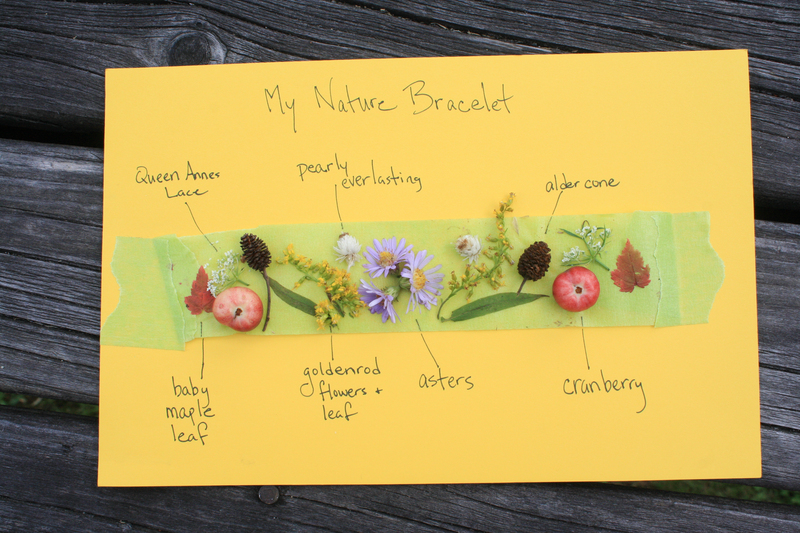 Last Friday we made fall nature bracelets and I was thinking about ways to take this project a step further for nature study when one of the kids in my nature group mentioned that she wanted to identify everything on her bracelet. Of course! (Kids are so awesome!) While we talk about the things they are putting on their bracelets as they go, they might not remember everything and it would be great to have not only the bracelet but a visual guide to their discoveries. In the past we had taped the bracelets to paper and displayed them on our cork board. Taking that to the next logical step, my daughter and I labeled the bracelets we later made at home collecting nature specimens from around the yard. These bracelets are so simple the impact can be deceiving, but they are fun and even addicting for some (mom and dad you will not be able to resist making one of your own). 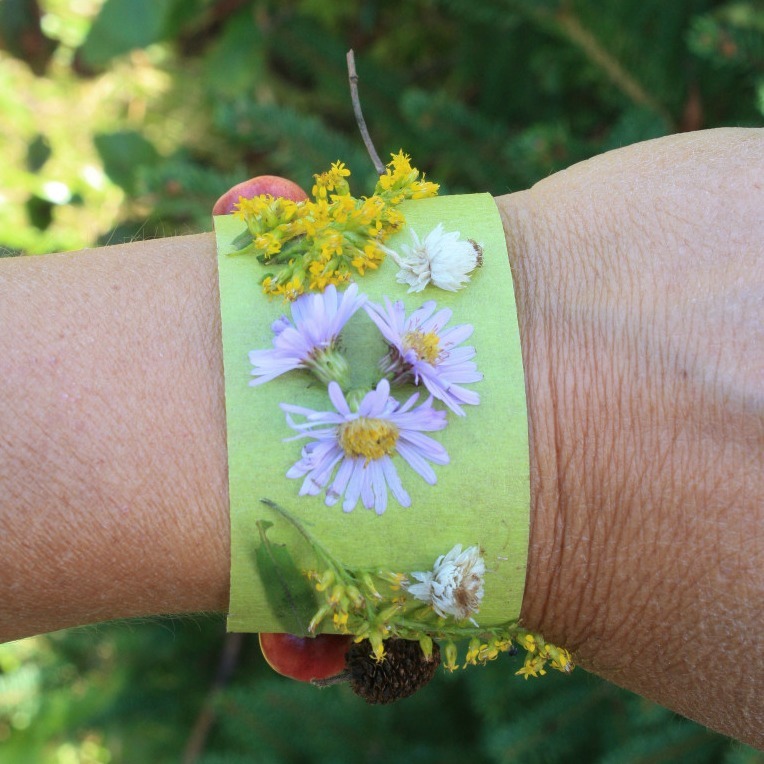 To make your tape into a bracelet wrap it around the wrist with the sticky side out and secure the ends together. As you walk along the trail collect things that attract your attention. You can simply put them on the bracelet any which way or you can be a bit more artistic about it and attempt a design. It is totally up to the creator! When you finish gently cut the bracelet off at a good spot (it is not always where the two end meet so ask the kids where they want the cut). Use some more tape to attach the bracelet to the card stock with room on the top and bottom for labelling. Label what you already know, then grab the guides and you are off! If you can’t find the answer you might ask the kids who they know that might be able to help them learn about the specimens on their bracelet. Is there an elderly neighbor that is a gardener and might know what the flowers are? Do you have a natural history museum nearby that might have someone who can help? Would grandma know? Maybe a group on the internet could help (like the Mud Puddles to Meteor Facebook group).